The taxi dropped us off at a remote Tuscan bed and breakfast, weeds and wildflowers lining the driveway. As we got out of the car, we saw a tall woman in a pristine white chef’s jacket walking towards us, carrying handfuls of fresh herbs. She introduced herself as Gina and led us into an old mill which had been converted to a one room kitchen/rec room for the family that owned the bed and breakfast. Exposed stone and high ceilings greeted us. We introduced ourselves to the others: couples from Minneapolis, New York, and Austin. 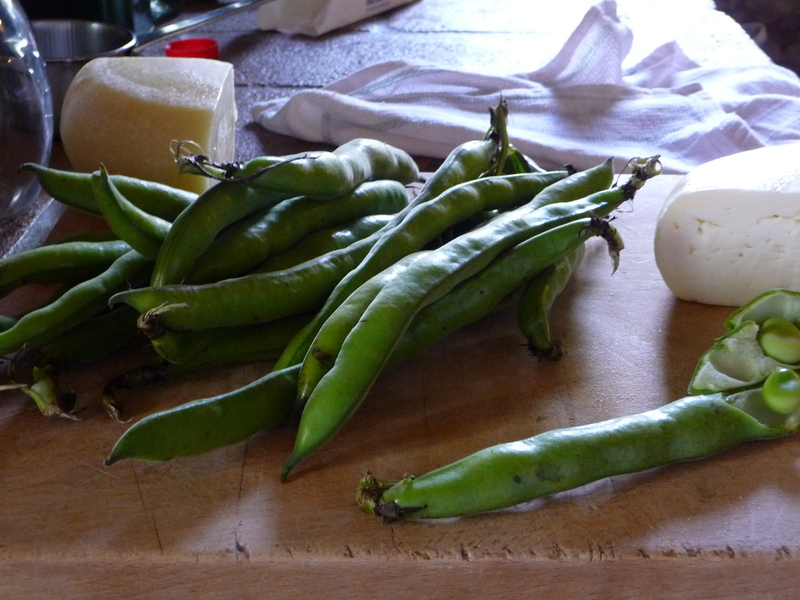 We snacked on fresh lava beans and soft, fresh pecorino cheese while waiting for the class to begin. Conversation flowed easily among us. We prepared dessert first, a “sweet salami” that contained crushed crackers (like animal crackers), sweet and unsweetened cocoa, butter, sugar, sweet wine, which we mixed all together and refrigerated. When we rolled it out, it looked like salami, though certainly didn’t taste like it. Each of us volunteered for tasks as we prepared what would turn out to be an amazingly delicious, yet simple, lunch. There were enough tasks to keep people busy, but not too much work to prevent us from chatting and enjoying wine as we cooked. A few hours later, we sat beneath a covered picnic table and enjoyed the fruits of our labor. 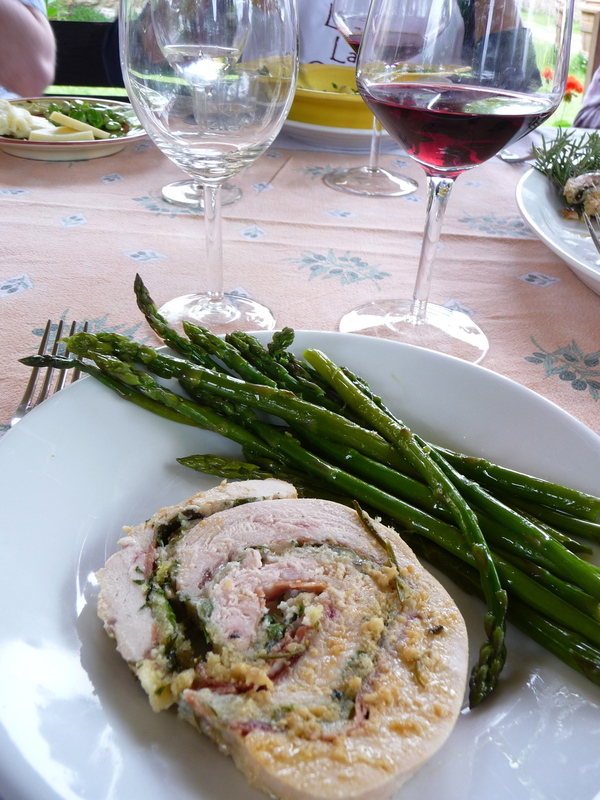 Stuffed turkey breast (with prosciutto and artichoke bread crumbs) and asparagus – delicious! 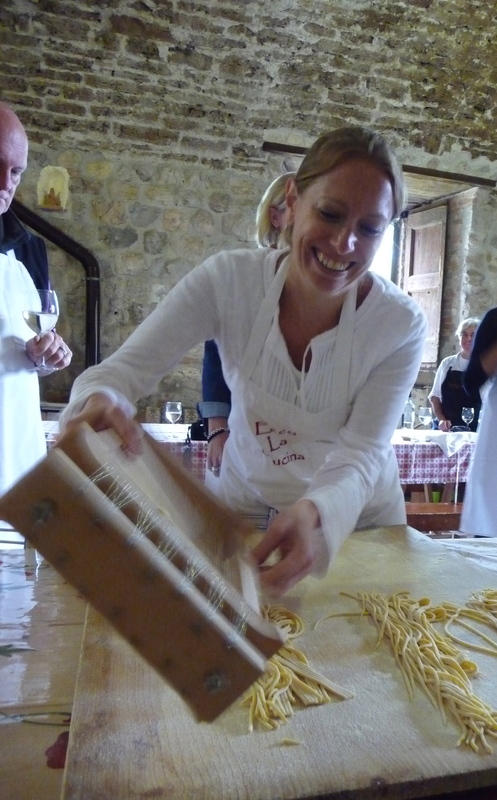 What a Fun Experience – thanks for sharing!